Friday 29th April 2016 – 8.40am – Claire Brown. 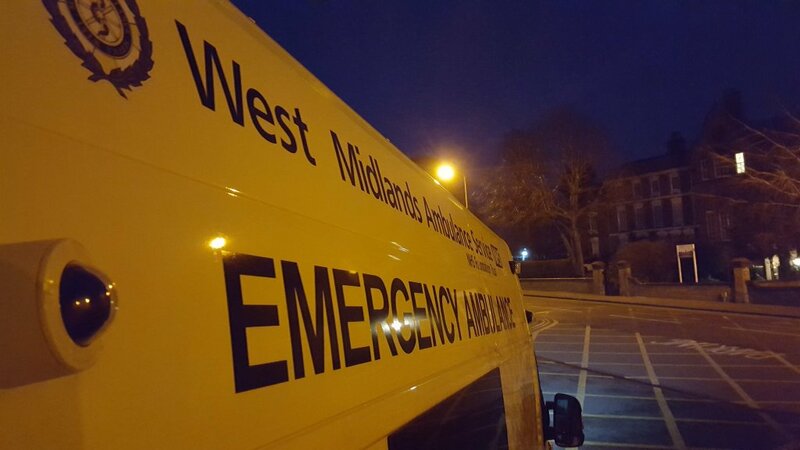 A man involved in a road traffic collision in Birmingham in the early hours of this morning received vital trauma care at the roadside before being rushed to hospital. 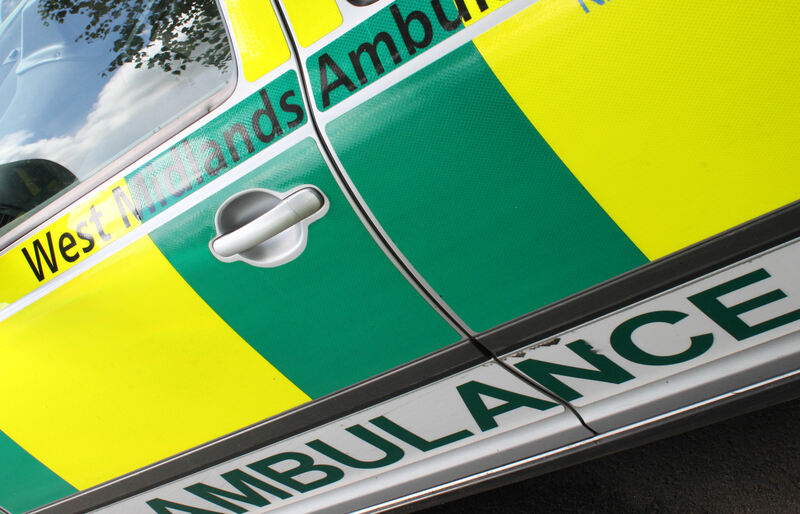 West Midlands Ambulance Service was called to reports of a serious collision on Thornhill Road, Streetly, Sutton Coldfield at 3.30am this morning (Friday). An ambulance, a paramedic area support officer and a MERIT trauma doctor attended. A West Midlands Ambulance Service spokeswoman said: “Crews arrived to find a man trapped in a car which had sustained significant damage. Working quickly with the fire service, ambulance staff and the doctor worked to release the man from the vehicle. Upon assessment ambulance staff found he had sustained multiple serious injuries. They worked as a team to fully immobilise the man whilst administering advanced trauma treatment to help stabilise his serious condition. Friday 29th April 2016 – 8.20am – Claire Brown. A woman has died in a house fire in Birmingham last night. 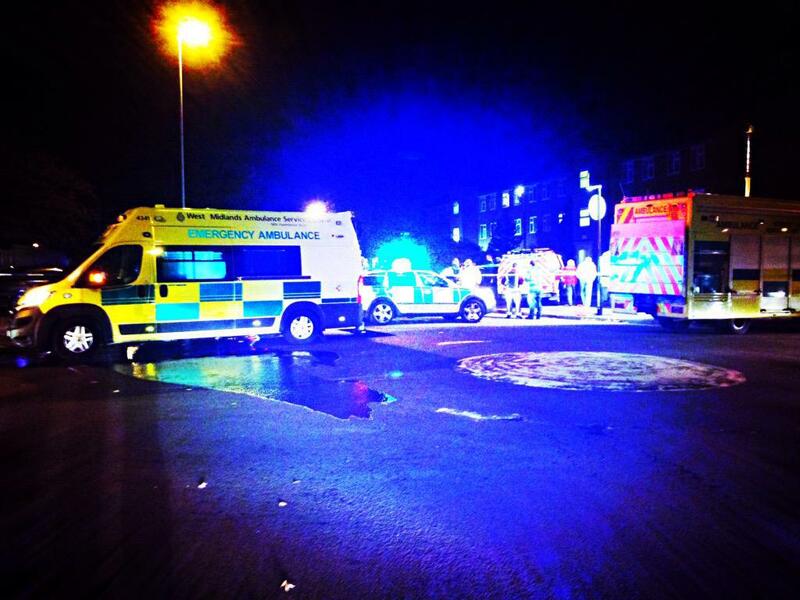 West Midlands Ambulance Service was called to Mears Drive, Stechford at 8.30pm (Thursday). An ambulance, a paramedic area support officer and paramedics from the Trust’s Hazardous Area Response Team (HART) attended along with the fire service. A West Midlands Ambulance Service spokeswoman said: “When ambulance crews arrived they found a house well alight with fire fighters actively tackling the blaze. A woman was found inside the property but sadly it quickly became apparent that nothing could be done to save her and ambulance staff confirmed her dead on scene. Thursday 28th April 2016 – 5.00pm – Claire Brown. 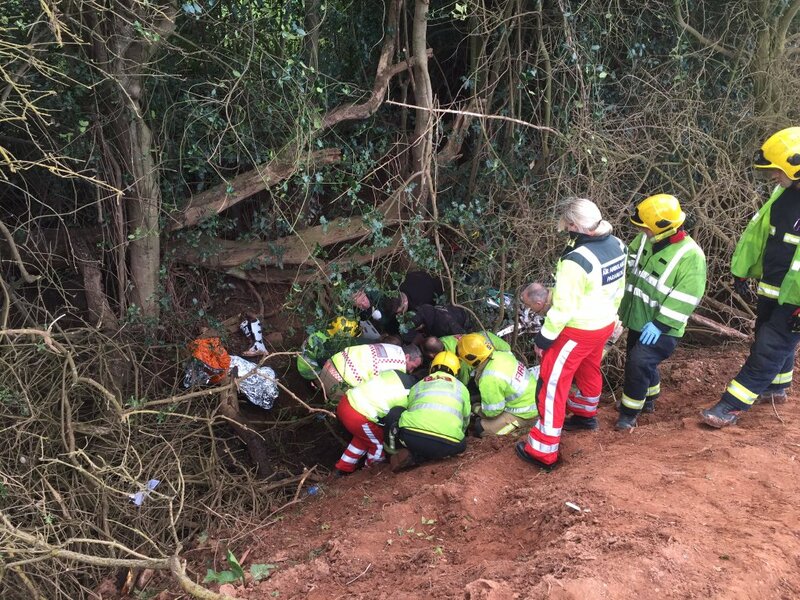 A man ended up in a water filled ditch at the side of the road following a collision with a van in Coventry this afternoon. The incident happened on the Coventry Road in Stoneleigh at 2.00pm (Thursday). Two ambulances were sent to the scene together with the aircrew from the Warwickshire and Northamptonshire Air Ambulance who responded by car and consisted of a doctor, a paramedic and a critical care paramedic. A West Midlands Ambulance Service spokeswoman said: “Crews arrived to find a pedestrian, a man believed to be in his 50s, who had reportedly been clipped by the wing mirror of a van which had knocked him down a 5ft watery ditch. “Upon assessment by ambulance staff, the man was found with multiple injuries and was suffering from the effects of hypothermia. The doctor administered advanced pain relief to help stabilise his condition before he was carefully carried out of the ditch on a stretcher and transferred into the warmth of the ambulance where he received further trauma care. Thursday 28th April 2016 – 3.30pm – Claire Brown. A man has received advanced medical care from ambulance staff before being rushed to a major trauma centre following a road traffic collision in Coventry this afternoon. West Midlands Ambulance Service was called to the junction of Sewall Highway and Sullivan Road in Coventry shortly after 1.15pm (Thursday). Two ambulances and a community paramedic attended. They were backed up by a doctor, paramedic and critical care paramedic from the Warwickshire and Northamptonshire Air base who travelled to the scene on blue lights by car. A West Midlands Ambulance Service spokeswoman said: “Ambulance staff arrived to find a man who was in a critical condition. The team of ambulance staff and the doctor worked together to administer advanced trauma care at the scene before he was transferred by ambulance on blue lights to University Hospital Coventry and Warwickshire, a major trauma centre. The doctor and critical care paramedic travelled on board the ambulance to continue treatment en route. Tuesday 26th April 2016 – 5.00pm – Claire Brown. A man whose heart stopped beating was revived thanks to a defibrillator and the swift actions of members of the public in Kidderminster. The man suffered a cardiac arrest in the street outside the job centre in Lower Mill Street, Kidderminster just before 11.30am this morning (Tuesday). An ambulance, a paramedic area support officer, a community paramedic and the Midlands Air Ambulance from Strensham with two critical care paramedics on board attended. A West Midlands Ambulance Service spokeswoman said: “The man collapsed in the street and was recognised as being in cardiac arrest. Medical staff from a nearby GP surgery were quickly on scene with a defibrillator and the team commenced CPR. An off duty paramedic was also on scene providing assistance. When ambulance staff arrived they took over resuscitation efforts and quickly transferred the man by land ambulance to Worcestershire Royal Hospital. The air crew jumped on board the ambulance to continue advanced life support en route. “Hospital medics were pre alerted to the arrival of the man and by the time the ambulance pulled up outside A&E, ambulance staff had managed to restart his heart and he was breathing for himself but remained in a serious condition. Tuesday 26th April 2016 – 9.30am – Claire Brown. Despite the best efforts of the ambulance service, a motorcyclist’s life couldn’t be saved last night following a collision with a car. West Midlands Ambulance Service was called to the Stratford Road in Wootton Wawen, Henley-in-Arden, shortly after 8.30pm (Monday). Two ambulances, a paramedic area support officer and a doctor from the Warwicshire and Northamptonshire Air Ambulance responding in a car, attended. A West Midlands Ambulance Service spokeswoman said: “Ambulance staff arrived to find a motorcycle which had been involved in a collision with a car. The motorcyclist, a man, was in traumatic cardiac arrest. The medic and ambulance staff worked as a team to deliver advanced life support on the man. Monday 25th April 2016 – 10.20am – Murray MacGregor. A car driver has died after a crash with a lorry this morning. West Midlands Ambulance Service was called to Alders Drive in Redditch at just before 8.00am on Monday morning. An ambulance was on scene within six minutes of the 999 emergency call and was backed up by a paramedic area support officer. A West Midlands Ambulance Service spokesman said: “When the ambulance crew arrived, they found a police officer carrying out CPR on the car driver. “The ambulance staff took over, but it quickly became apparent that nothing could be done to save the man and he was confirmed dead at the scene. “Both vehicles were badly damaged. Friday 22nd April 2016 – 9.30am – Jamie Arrowsmith. A motorcyclist has died following a collision with a car yesterday afternoon (Thursday). The incident took place on Pound Lane in Lillington, Leamington Spa, shortly before 4.50pm and West Midlands Ambulance Service sent two ambulances and a paramedic area support officer to the scene. The Warwickshire and Northamptonshire Air Ambulance crew also attended in a rapid response vehicle. A West Midlands Ambulance Service spokesman said: “On arrival, crews discovered a motorcyclist in cardiac arrest following a collision with a car. “Crews immediately began administering CPR and advanced life support. “However, unfortunately it became apparent that nothing could be done to save the man and he was confirmed dead at the scene. Thursday 21st April 2016 – 9.40am – Jamie Arrowsmith. Two people suffered serious injuries following a collision between a car and a building that left three people trapped inside the vehicle last night (Wednesday). The crash took place on Millfields Road in Bilston shortly before 9.30pm and West Midlands Ambulance Service sent three ambulances, a paramedic area support officer, a community paramedic in a rapid response vehicle, a BASICS doctor and a MERIT trauma doctor to the scene. A West Midlands Ambulance Service spokesman said: “On arrival, crews discovered a car that had suffered significant damage in the collision with three patients trapped inside. “Following assessment of the patients, crews worked closely with the fire service to free them from the car once the roof had been cut off. “The driver, a man thought to be in his 20s, was treated for a head injury as well as arm and leg fractures. He was given pain relief on scene, immobilised and transferred to Queen Elizabeth Hospital, Birmingham on alert. “A man believed to be in his 40s received treatment for an abdominal injury, a suspected pelvic fracture and fractures to his arm and wrist. He was also given pain relief and alerted in to the same hospital. Wednesday 20th April 2016 – 10.02am – Murray MacGregor. A motorcyclist has had a number of lucky escapes after a crash last night. After the collision with a roundabout, the rider firstly survived ending up about 100 yards away from his bike; secondly he had landed on a grass verge reducing the impact; and finally, narrowly missed a tree as he slid along the grass. The incident happened at the junction of the A452 Collector Road and Moorend Avenue in the Castle Bromwich area of Birmingham at around 8.40pm last night. A paramedic area support officer was first on scene and was backed up by an ambulance. A West Midlands Ambulance Service spokesman said: “Crews arrived to find the rider a considerable distance from his bike. “The 22 year old was initially reported as being unconscious but he had come round when crews arrived, though he was not fully conscious and appeared quite confused. “Amazingly, he had no obvious injuries but due to his confusion, crews suspected some sort of head injury. As a precaution he was immobilised before being taken on blue lights to Heartlands Hospital. Wednesday 20th April 2016 – 9.04am – Murray MacGregor. A cyclist has suffered multiple injuries after a crash on a dual carriageway. The crash also involved a car and a lorry and happened on the A45 between Birmingham Airport and the Stonebridge Island in the Meriden area at about 10.25pm last night. An ambulance arrived on scene just four minutes after the initial call. The crew was backed up by a doctor from the Warwickshire and Northamptonshire Air Ambulance in a car, a second ambulance, a paramedic area support officer and the MERIT Trauma Doctor. A West Midlands Ambulance Service spokesman said: “The rider had suffered multiple significant injuries in the crash that left his bike very badly damaged. 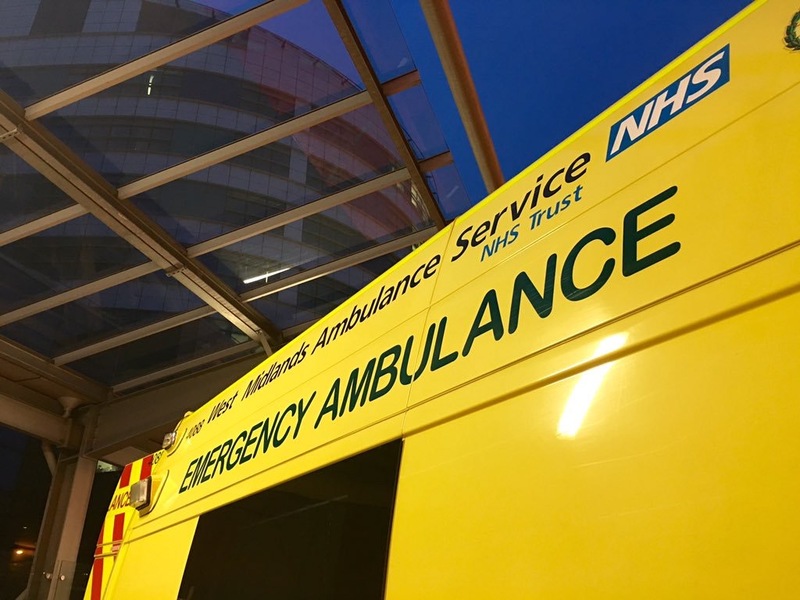 “The patient was sedated by the doctors and was immobilised before being taken by ambulance using blue lights to the major trauma centre at the Queen Elizabeth Hospital in Birmingham with the MERIT trauma doctor travelling with the crew to continue treatment en-route. Tuesday 19th April 2016 – 5.30pm – Claire Brown. An elderly man who took a tumble down a bank whilst out walking in Church Stretton this afternoon was rescued thanks to quite a few helping hands. West Midlands Ambulance Service was called to Carding Mill Valley in Church Stretton at around 1.45pm (Tuesday). An ambulance and a paramedic area support officer attended. The fire service were also on scene. A West Midlands Ambulance Service spokeswoman said: “The patient was located about 500 yards from where the ambulance had parked at the top of Carding Mill Valley; the nearest location it could reach. 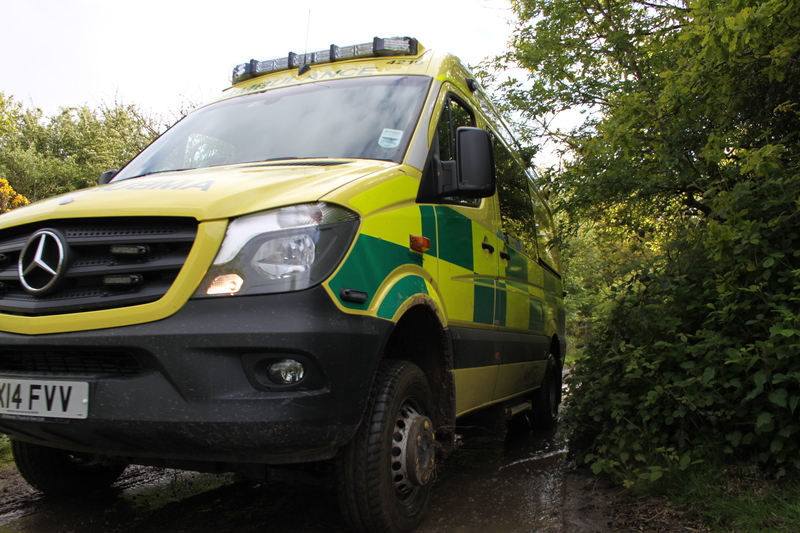 The ambulance staff were met by National Trust rangers and volunteers who used their specialised 4×4 vehicle to take them part-way to where the patient was. The team then walked the remainder of the way up a bank where, upon arrival, they found a 71-year-old man who had suffered a hip injury and was unable to walk. He had reportedly lost his footing on a pathway and ended up tumbling about 10 – 15 feet down a bank. “The man was given pain relief and once comfortable, ambulance staff immobilised the man onto a scoop stretcher. The man was then carried back down to the 4×4 vehicle with help from the volunteers, rangers and the fire service. Once strapped on board, the man was carefully driven back to the awaiting ambulance before being taken to Royal Shrewsbury Hospital. Tuesday 19th April 2016 – 12.10pm – Claire Brown. 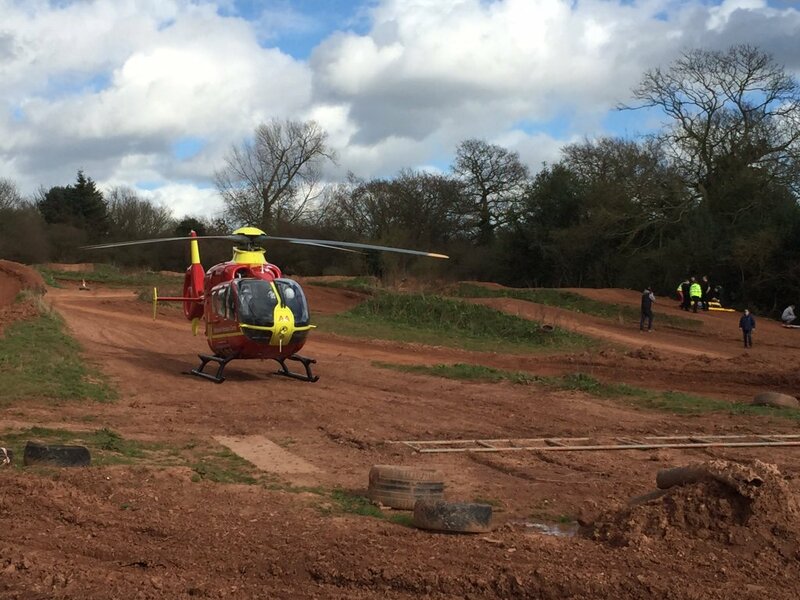 A man has been airlifted to a major trauma centre after falling approximately 10 feet from a ladder in Kidderminster this morning. The incident happened shortly before 9.00am (Tuesday) at a construction site on Stourport Road, Kidderminster. An ambulance and the Midlands Air Ambulance from Cosford with a MERIT trauma doctor on board attended the scene. A West Midlands Ambulance Service spokeswoman said: “The man, believed to be in his 40s, had reportedly been knocked unconscious after falling around 10 feet from a ladder. Tuesday 19th April 2016 – 9.00am – Claire Brown. A canister released into a McDonald’s restaurant in Stafford left two people in hospital and ten others requiring treatment on scene by ambulance staff last night. West Midlands Ambulance Service was called to McDonald’s on the Eccleshall Road in Stafford shortly before 8.45pm (Monday). A paramedic area support officer and three ambulances attended along with police and fire colleagues. A West Midlands Ambulance Service spokeswoman said: “Upon arrival, ambulance staff found 12 people outside McDonald’s who had exited the restaurant after a canister had been released inside. “The 12 patients, made up of staff and customers, were suffering varying degrees of respiratory and stomach irritation. Of the 12 patients assessed on scene by ambulance staff, two teenage girls needed further hospital treatment. A 17-year-old girl had severe respiratory irritation whilst an 18-year-old girl had severe abdominal pains. Both were taken by land ambulance to Royal Stoke University Hospital. The remaining 10 patients were discharged on scene. Notes to Editors: There are no more details regarding this incident. Please contact Staffordshire Police. Monday 18th April 2016 – 10.40am – Claire Brown. A road traffic collision in Stourbridge could have been so much worse last night but metal railings did their job. West Midlands Ambulance Service was called to outside The Chequers Inn on the Stourbridge Ring Road in Stourbridge at 10.20pm (Sunday). An ambulance, a responder paramedic and a paramedic area support officer attended. A West Midlands Ambulance Service spokeswoman said: “Crews arrived to find a car which had collided with metal railings at the side of the ring road. “The three occupants in the car, three young men, were checked over by ambulance staff. Two of the men suffered no apparent injuries whilst the third was given treatment on scene for an arm injury and a suspected minor head injury. He was taken to Russells Hall Hospital for further care. As a regular user of the internet and social media, we know the power of online material and the good that it can do. Whether it’s educating people about how to do CPR, highlighting the exceptional work of our staff in delivering clinical care in an emergency or advising the public when to call 999, we’re able to spread good news and useful information to more people than ever before. Unfortunately, there are significant concerns internationally about how terrorists and extremists are using the use of the internet and social media to spread words of hate, violence and extreme views. They are known to target young and vulnerable individuals with the intention of grooming them into terrorist activity. Andy Proctor, Head of Safeguarding and Prevent Lead for the Trust, said: “This weekend, the Counter Terrorism Internet Referral Unit (CTIRU) along with colleagues from other specialist UK and international police partners will be carrying out internet searches and responding to public referrals about terrorist and extremist online content. Friday 15th April 2016 – 12.40pm – Murray MacGregor. A young boy has suffered critical injuries after a collision with a car. It happened in Repington Road in the Sneyd Green area of Stoke-on-Trent at around 4.55pm on Thursday afternoon. An ambulance was on scene in five minutes and was backed up by a rapid response vehicle, a senior paramedic officer, a BASICS Emergency Doctor from the North Staffordshire Scheme and the Midlands Air Ambulance from Staffordshire. A West Midlands Ambulance Service spokesman said: “On arrival, it was clear that the child had suffered very serious injuries. “He was anaesthetised by the doctor before being taken on blue lights to Royal Stoke University Hospital with advanced life support being undertaken. Thursday 14th April 2016 – 11.50am – Jamie Arrowsmith. A man has been airlifted with extremely serious injuries following a collision between a car and a lorry this morning. West Midlands Ambulance Service was called to the A443 in Lindridge, Worcestershire, shortly before 6.40am and sent two ambulances, a community paramedic in a rapid response vehicle, a paramedic area support officer and the Warwickshire and Northamptonshire Air Ambulance to the scene. A West Midlands Ambulance Service spokesman said: “Crews arrived to discover a car and lorry that had both suffered front end damage following the collision. “There were two patients, both still inside the car, a man and a woman who are both thought to be in their 20s. “Ambulance staff assessed both patients before carefully working alongside the fire service to free them from the vehicle. “The man was treated for significant chest and head injuries and once his condition had been stabilised he was airlifted to Queen Elizabeth Hospital, Birmingham. Thursday 14th April 2016 – 9.40am – Murray MacGregor. Specialist ambulance staff were called to support firefighters tackling a large factory fire in Shrewsbury in the early hours of this morning. Firefighters had been on scene at Stadco Ltd in Harlescott Lane in Shrewsbury for about an hour when they requested ambulance support due to the complex nature of the incident and the use of breathing apparatus. Initially an ambulance and a paramedic area support officer were sent and were later backed up by the Hazardous Area Response Team. A West Midlands Ambulance Service spokesman said: “All members of staff had been safely evacuated without incident, but ambulance staff remained on scene while the firefighters tackled the fire, which was in a restricted access area with the potential for chemicals to be involved. Wednesday 13th April 2016 – 8.40pm – Murray MacGregor. 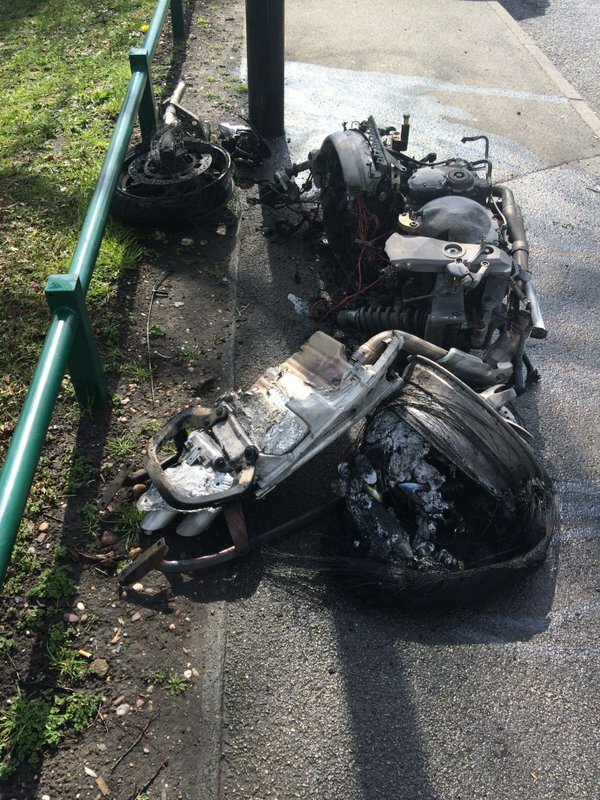 A combination of wearing good quality safety gear and the quick actions of bystanders has ensured a motorcyclist avoided serious injury after his bike went on fire after a crash. The incident happened at the junction of Water Orton Lane and Cottage Lane in Minworth on the outskirts of Sutton Coldfield. An ambulance and a paramedic area support officer were sent after no fewer than five 999 calls at about 11.40am on Wednesday morning. A West Midlands Ambulance Service spokesman said: “There was a collision between the motorcycle and a car at the junction. Bystanders at the scene told ambulance staff that the rider landed about 10 metres away from the car and the bike had ended up on the pavement where it caught fire. The people at the scene dragged the rider away from the blaze. 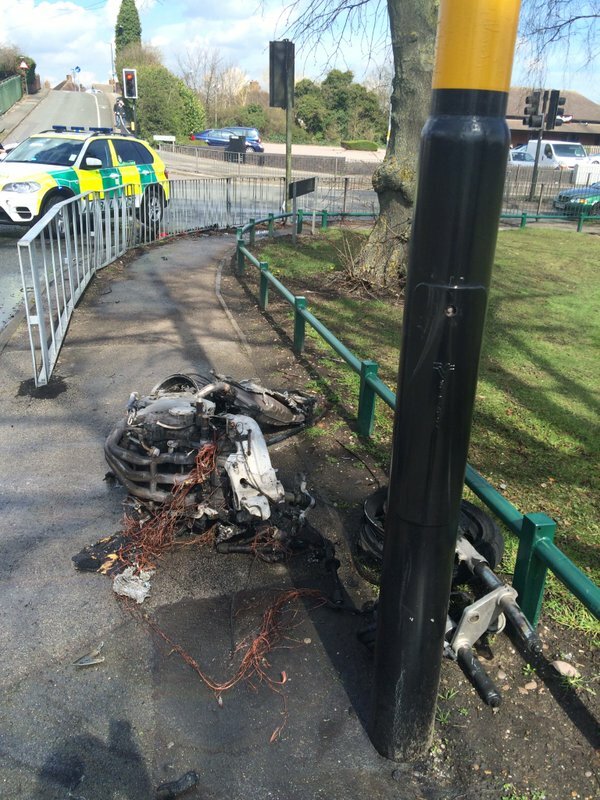 “The bike was completely destroyed, while the car had damage to the bonnet. “We’d pay tribute to the fast actions of the members of the public for ensuring the rider was safely away from the fire. “Although the 39 year old rider suffered a dislocated shoulder, a possible fracture to his collar bone and was complaining of hip pain, the level of injury was almost certainly reduced by him wearing full leathers, crash helmet and motorcycle boots; it lessened the level of injury. The driver of this car is extremely fortunate not to have suffered serious injuries. We received no fewer than five 999 emergency calls to the scene between the two slip roads on the southbound M6 at junction 7 at just before 4.00pm on Tuesday afternoon. The man driving managed to get out himself. After being examined by a critical car paramedic, he was taken by ambulance to Heartlands as a precaution. He was immobilised due to the level of damage to the car. Also in attendance were a paramedic area support officer and a rapid response vehicle from HART and our colleagues from fire and police. Tuesday 12th April 2016 – 9.20am – Murray MacGregor. A motorcyclist has died after a crash in the early hours. Two ambulances, a paramedic area support officer and the MERIT trauma doctor were sent to the scene after three 999 emergency calls at 1.40am on Tuesday morning. A West Midlands Ambulance Service spokesman said: “An ambulance was on scene within five minutes of the first call. Monday 11th April 2016 – 7.34pm – Murray MacGregor. 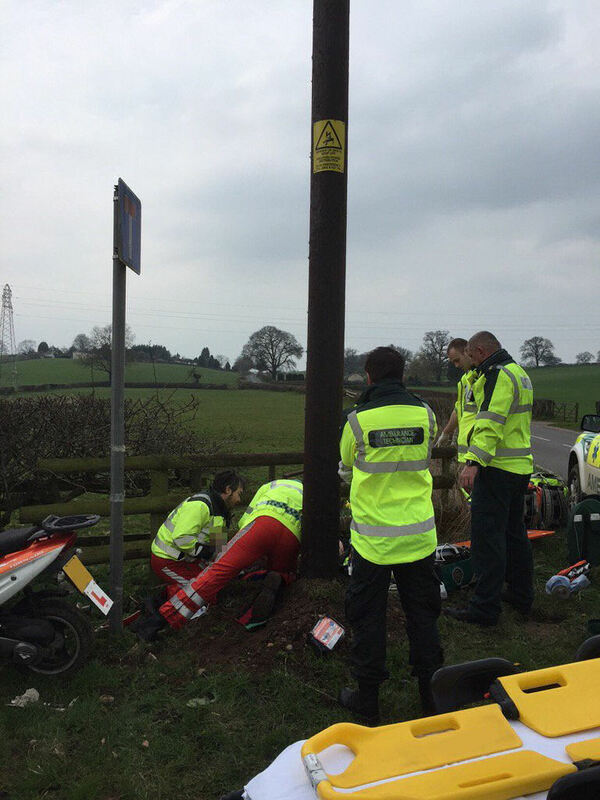 A teenage girl has been airlifted after suffering a serious leg injury after coming off her scooter and colliding with a telegraph pole. The crash happened on the B5026 near the junction with Shut Lane at Croxton in Staffordshire at about 2.15pm on Monday afternoon. A community first responder from the Eccleshall scheme was first on scene and was backed up by an ambulance, a paramedic area support officer and the Midlands Air Ambulance from Staffordshire. A West Midlands Ambulance Service spokesman said: “Crews were told that the bike was the only vehicle involved. It hadn’t suffered too serious damage but the rider, a teenage girl, had suffered a badly broken leg and was complaining of pelvic pain too. Fourteen people have been involved in a road traffic collision in Telford this afternoon. 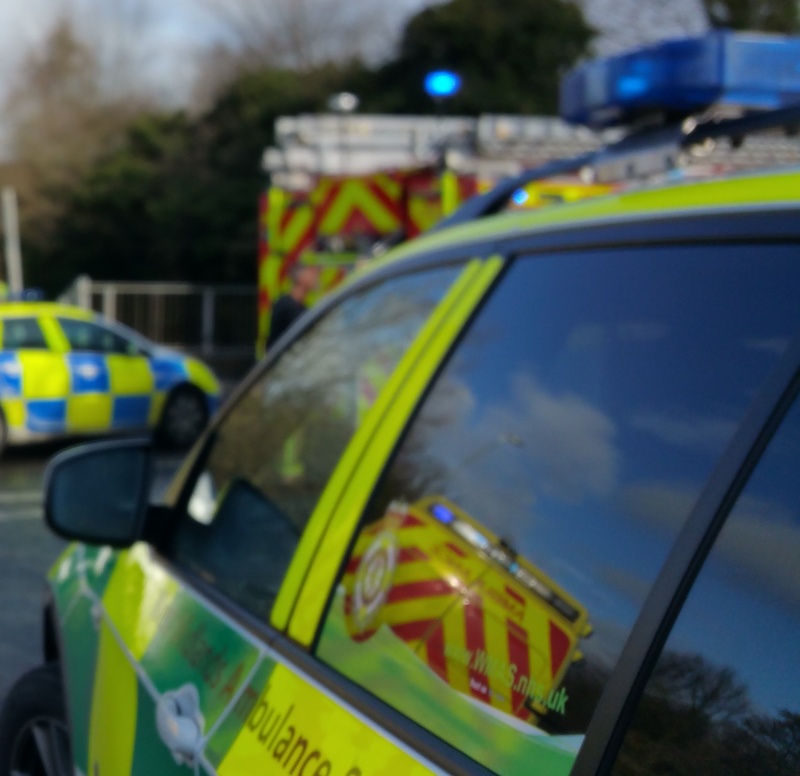 West Midlands Ambulance Service was called to a four car road traffic collision at the junction of the B5063 and Crowdale Road in Shawbirch at approximately 1.55pm today. Three ambulances and a paramedic area support officer in a rapid response vehicle attended the scene. A West Midlands Ambulance Service spokeswoman said: “Crews arrived to find four vehicles that had been in collision and a large number of occupants, that had been travelling in the cars, at the side of the road. “One man in his 60’s, from a car that had sustained the most damage, was treated for chest pain from a suspected seat belt injury. The man was given pain relief at the scene and conveyed to the Royal Shrewsbury Hospital. 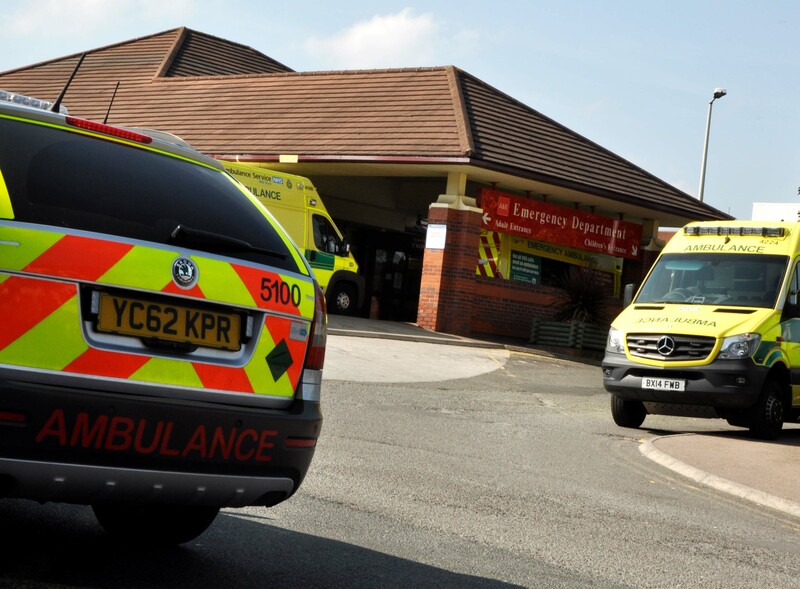 “A woman, believed to be in her late 20’s, who was travelling in another vehicle was treated at the scene for a laceration to her head before being taken to Princess Royal Hospital for further treatment. “A man from a third vehicle was treated for neck pain. Due to the nature of the injury he was immobilised as a precaution and conveyed to Princess Royal Hospital for further assessment. Monday 11th April 2016 – 4pm – Chris Kowalik. Fancy talking to someone about volunteering as a lifesaver or learning how to do CPR? Evesham Area Community First Responders (CFR) will be at the town’s Riverside Shopping Centre’s Octagon all day, every day from April 19th to 24th (inc). The week-long event, which will also feature the town’s Street Pastors aims to raise awareness of the volunteers who give up some of their spare time to help their local community. Organisers also hope it’ll spur people on to consider signing up as a future Community First Responder or a volunteer helper to assist with charitable events, flag days, training and administration. They are also hoping the event will help raise funds for much needed lifesaving equipment. To become a Community First Responder, you would first be trained by West Midlands Ambulance Service in a variety of assessments and techniques and complete observational shifts with ambulance crews before going live. After successfully completing the course, volunteers can then ‘book-on’ with the ambulance service’s control room, ready to respond to nearby medical emergencies while a blue-light ambulance is en-route. ‘Evesham Area Community First Responders’ is part of Hereford & Worcester Community First Responders (a registered charity, number 1124035) and covers Evesham and its surrounding communities. For more information about ‘Evesham Area Community First Responders’ visit http://www.eveshamcfrs.org or find them on facebook. For more information about the work of Community First Responders, visit http://www.wmas.nhs.uk under “About us”. Monday 11th April 2016 – 1.15pm – Murray MacGregor. The skilful driving of a member of staff in a 4×4 ambulance ensured a woman who had fallen from a horse got to hospital in a timely manner. The woman was unseated about 800 metres away from the nearest road, up a dirt track. An emergency 999 call was received at about 3.15pm on Saturday afternoon to the location, which was in the middle of fields up a track between the villages of Brandon and Bretford in Warwickshire. A West Midlands Ambulance Service spokesman said: “The initial ambulance crew that was dispatched quickly realised that their ambulance was not going to make it to the patient due to the wet mud on the track, so walked the half mile to the patient with their equipment. “Given the nature of her neck and back injuries and the location, they requested an air ambulance be sent to provide advanced pain relief and the Midlands Air Ambulance from Strensham was sent. “The woman who was in her 40’s needed to be taken to hospital, but due to two other patients in critical conditions being airlifted into the nearby University Hospital Coventry & Warwickshire, there would not have been anywhere to land the aircraft at the hospital. 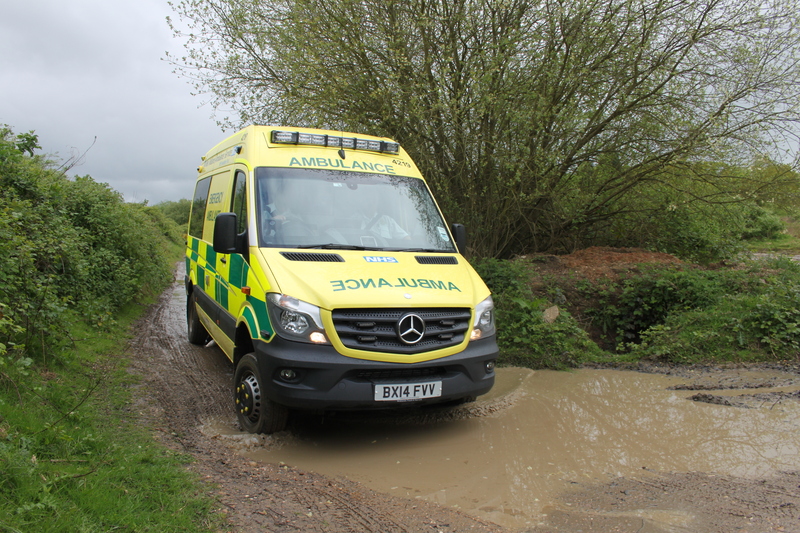 The crews decided that the best option was to use one of the Trust’s 4×4 ambulances. “It was able to make its way to within about 100m of the scene before the driver became concerned that even it wouldn’t make it through the mud. “Working together, the crews carried the woman, who had been immobilised, to the 4×4 ambulance which was able to get back to the roads and onto hospital. Do you know what to do if you see a blue light either in front of you or behind? West Midlands Ambulance Service can confirm one of its ambulance crews came across a child walking alone in Stechford, shortly before 4.05pm today. The boy was checked over by the crew before being take home to be reunited with his parents. We are unable to give any further information regarding this case. Friday 8th March 2016 – 4.30pm – Murray MacGregor. 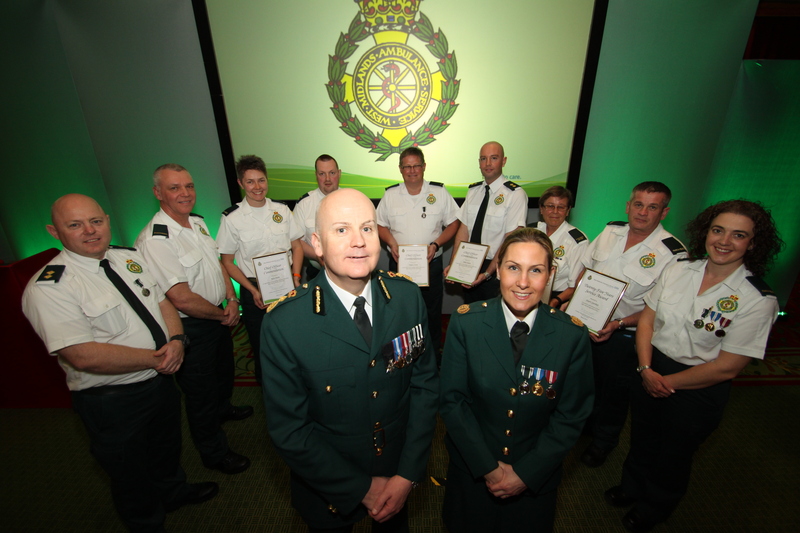 Dozens of staff from West Midlands Ambulance Service, volunteers and members of the public have been honoured at a ceremony in Warwickshire for their outstanding actions in helping others and saving lives. A range of awards including the Queen’s Long Service Medal and Chief Officer Commendations were awarded at the Long Service and Excellence Awards ceremony, sponsored by Zoll UK Ltd. and SafeTriage at the Heart of England Conference & Events Centre on Tuesday 5th March. This year, 25 operational members of staff became eligible for their 20 year Long Service and Good Conduct Medal which were presented by the Vice Lord Lieutenant of the West Midlands, Colonel George Marsh TB. In addition, 10 staff were commended for 25 years service; nine received certificates for 30 years service; 17 were honoured for 35 years in the Trust; while an incredible 11 staff were honoured for their 40 years service. The combined total from the long serving staff comes to an amazing 2,055 years. This award goes to a very courageous young girl who demonstrated bravery at an incident that happened at her home in Telford in July 2015. At six years of age, Cerys Evans witnessed her brother having a rare convulsion. Cerys lowered him from the sofa to the floor and placed him in the recovery position whilst shouting to her mum for help. Cerys remained calm and took swift, decisive actions with potentially life-saving actions. Katie is a young lady who witnessed her mum fall through a glass coffee table while out shopping. Katie went to get help from a shop assistant whilst her dad stemmed the bleeding. She receives her award for showing immense strength and bravery on that day. Joseph is a young boy who displayed bravery well beyond his years whilst at an incident that happened at his home in Oldswinford in July 2015. At five years old, he witnessed his dad become unconscious. Joseph was extremely helpful, even telling the controller that he could not reach the lock on the front door and so he was waiting for the ambulance at the back gate. Joseph remained calm and cheerful whilst his dad was receiving treatment. There is no doubt that his dad’s recovery was a result of Joseph’s mature manner and actions. Bella and Zoe are 11 years old. Following a visit from Worcester Paramedic Alison Vinson to Pitmaston Primary School, the two girls went home and made their own instructions to show children how to use an AED (automated external defibrillator). The girls felt inspired to make this video in order to help other children learn and to show that children can learn the skill. Alison Vinson now uses their video to show other children in schools just how easy it is. Alison also use it as a ‘selling point’ in order to get anxious head teachers on board with the scheme. To date, their video has had about 15,000 views! We have been inundated with compliments for the girls from both the public and the media. We have even forwarded the video to a local MP to show him just how easy it was to teach CPR/defibrillation to children. So, you’re in a Worcestershire farmyard faced with a raging bull that has just attacked a farmer. You and your colleagues get the injured farmer to safety but the bull you have managed to get into a temporary pen is keen to escape once again and go on the attack. What do you do? If you are Keith, you manage to pacify the angry animal and avoid it breaking out of a flimsy compound ensuring the safety of the patient and colleagues around you. His actions earned him high praise from his colleagues on the day. In May of last year, Ben Rhodes was conveying a patient in his rapid response vehicle when he witnessed another car leave the road, colliding with a wall. That car caught fire and Ben pulled the patient from the burning vehicle. Carl is given an award for his commitment over many years to the role of Ambulance Services coordinator for the Civilian Services Contingent. It has meant that the Service is represented at a range of formal engagements such as Remembrance Day at the Cenotaph in London, to more local events and celebrations. 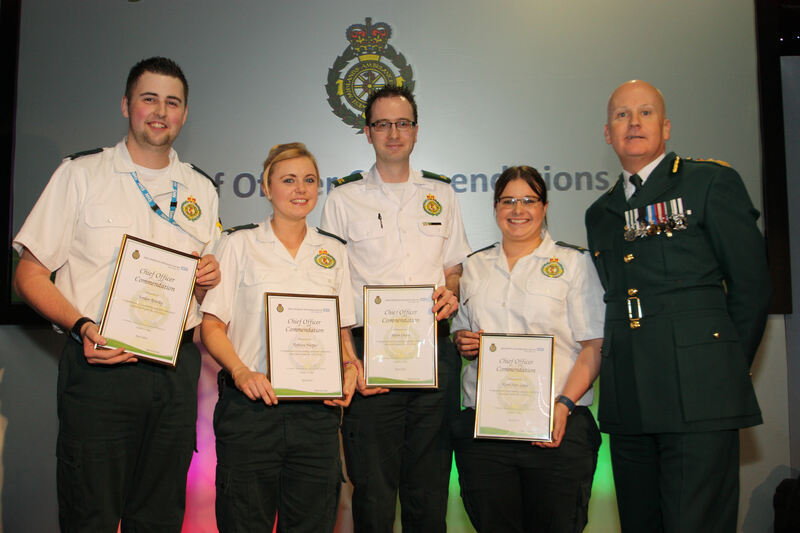 In May 2015, four of our student paramedics were on their fourth week of study. Whilst travelling home they came across an incident in Himley, Dudley, where four patients, including two children, had all sustained injuries in a road traffic collision. The four student paramedics stopped and rendered aid until crews arrived. The students then remained on scene assisting the crews with patient assessment and transfer. This award goes to two brave operational colleagues who, without hesitation, climbed into the back of a refuse collection truck to administer supportive treatment including IV analgesia to a patient whose legs were trapped by the compacted refuse. One of the key strengths of the ambulance service is its teamwork. This was exemplified by Duncan’s compassionate support for a team member through a personal family crisis. His organisation and management not only allowed a father to see his unwell daughter in hospital but also kept the service running smoothly. In August 2015, student paramedic Sophie Greener was out with an ambulance crew when they were faced with a multi casualty fatal road traffic collision with no one else on scene. The incident was on the opposite carriageway from their location on the M69 between Leicester and Coventry. Working with the other members of the crew, Sophie Greener contacted control and responded via the next junction possible. They remained calm, focused and continued with the treatment of patients until cleared by East Midlands Ambulance Service crews who attended the incident. In August 2015 a 23 month old was found face down in a pond in Rugeley, Staffordshire. The call came through as a cardiac arrest and was handled very calmly and professionally by the call assessor. Cardiopulmonary Resuscitation (CPR) advice was given to a very high standard until the arrival of a Community First Responder, followed shortly after by the ambulance crew, the Area Support Officer and the Midlands Air Ambulance. At the end of the call the child could be heard taking some breaths without assistance and was flown to Birmingham Children’s Hospital where she fully recovered. The award is presented for the promptness and accuracy of your combined actions and dedicated teamwork which has contributed to saving the life of this child. We have many dedicated Patient Transport Services staff whose passion and efforts help save lives every day. Michelle Smith, was on her way to complete her ‘First Person on Scene’ first aid course when she came across a serious road traffic collision. Whilst waiting for the ambulance she treated the patient’s serious injuries, liaised with Emergency Operation Centre and assisted the crew and Doctor on their arrival. In December 2015, Christopher was working as part of a Patient Transport Service crew in Coventry. Unfortunately, during the Sunday shift, his crew mate had a serious asthma attack. Christopher’s prompt actions in assisting her and the A&E crew that responded to his raising of the alarm helped his colleague to have a positive outcome. Not only did he go above and beyond at the scene he also phoned his colleagues husband and family to inform them of the situation. The age of retirement is moving upwards as we are all well aware. For some people retirement never entered their head and we are pleased to welcome a paramedic from Lichfield who is now officially our oldest paramedic on frontline duty. Peter Hill is 72 year old and still very much part of the Lichfield operations. 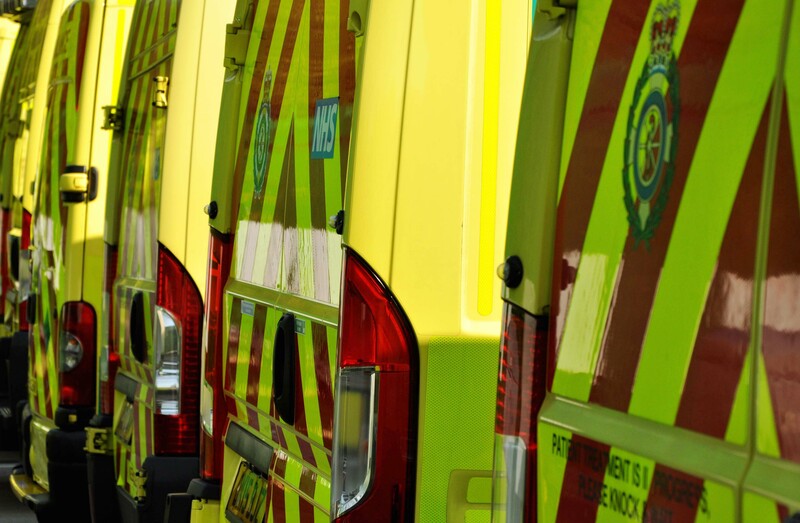 In the summer of 2015 NHS England commenced significant work to re-assess how the National Ambulance Response Standards should look for the future, recognising the current response standards were out-dated. WMAS was asked to join this important work as an operational trial site. At the same time, NHS England also realised they need to collect, collate and analyse significant operational data from each Trust, both within the trial sites but also for all Trusts nationally. NHS England specifically asked WMAS if Tracy Raymond Bishop could be put forward to lead this important piece of work. Tracy developed significant data collection methodology and analysis tool to ensure this large quantity of data could be collected efficiency and effectively over a six and 12 month rolling period. This information is being used to forge the new emerging national Ambulance Response Standards. Rev. Dr Stone has been our Chaplain for 13 years and during that time he has tirelessly raised the spirits of our people with his interest, friendliness, good humour and compassion. He has been a welcome and familiar face around our region and will be missed by all who know him. Reverend Stone, we thank you for your service. • Left-click on the appropriate thumbnail to reveal a full-size picture. • Left-click on the download icon (downward pointing arrow to horizontal line) if present .From the resultant list of picture file sizes, select “original”. Select “Save” or “Save As”. Thursday 7th April 2016 – 1.15pm – Murray MacGregor. A moto-cross rider who left a course and crashed into trees before falling into a water filled gully has been airlifted to a major trauma centre. The 25 year old was riding at the track, just off Packington Lane, Meriden, next to the M6 motorway at about 3.40pm on Wednesday afternoon. An ambulance was initially sent to the scene but they quickly requested an aircrew and the Midlands Air Ambulance from Staffordshire was sent. A West Midlands Ambulance Service spokesman said: “When crew arrived they found a man at the bottom of a steep slope in trees. “Other riders at the track described how the man had come over a jump and then crashed into the trees. “The man, who comes from the Black Country, was sitting in a muddy stream bed against a holly bush. “He was complaining of head, neck and back pain and also had a fractured collar bone. “As well as the steep slope, the ground was so soft that crews sank into mud up to their ankles as they treated the man so they used back boards to give them a hard surface to work from. “They requested assistance from firefighters to get the man back up the slope and one crew from West Midlands Fire Service and another from Warwickshire Fire and Rescue Service attended. “The firefighters were extremely helpful, clearing a way for the man to be brought back to the top of the slope after he had been immobilised. “He was then airlifted to the major trauma centre at the Queen Elizabeth Hospital Birmingham. Wednesday 6th 2016 – 2.15pm – Suzie Wheaton. West Midlands Ambulance Service was called to Wiggin Street in Birmingham to reports of a house explosion at approximately 12.20pm today (Wednesday). An ambulance, the Hazardous Area Response Team, a paramedic area support officer, a critical care paramedic in a rapid response vehicle and the Midlands Air Ambulance from Cosford with the MERIT trauma doctor on board were dispatched to the scene. A West Midlands Ambulance Service spokeswoman said: “Crews arrived to find a house that had collapsed following a suspected explosion. Other neighbouring properties had also been damaged. “One woman, who was believed to have been in the property at the time of the explosion had managed to get out of the building herself despite the damage. She was assessed by ambulance staff and discharged at the scene. “A second patient, a man, who was also believed to have been in the property at the time of the incident had made his own way to City Hospital. The aircrew and critical care paramedic attended the hospital, where the man was being treated for serious burn injuries. “Due to his condition the man was conveyed, via land ambulance, to the major trauma centre at Queen Elizabeth Hospital in Birmingham. The trauma doctor travelled on board the ambulance continuing to provide emergency care whilst en route. 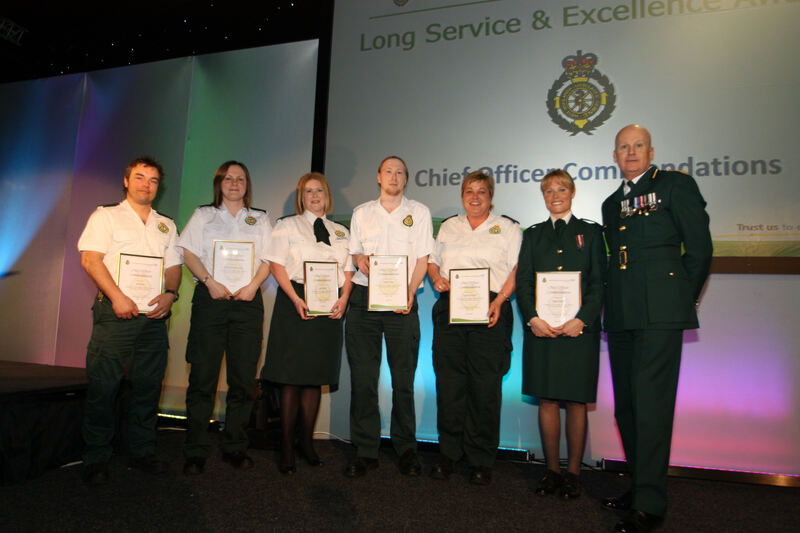 Our Long Service and Excellence Awards sponsored by Zoll and SafeTriage is a chance for us to pay tribute to long serving ambulance staff and award commendations for outstanding actions not only in this country but overseas as well. Monday 4th April 2016 – 5pm – Jamie Arrowsmith. A van driver who was trapped inside his vehicle for about 45 minutes had to be cut free through the roof of his cab following a collision with a lorry on the M6 this afternoon. West Midlands Ambulance Service was called to the southbound carriageway, between junctions 7 and 6, at about 2.45pm and sent an ambulance and a paramedic area support officer to the scene. A West Midlands Ambulance Service spokesman said: “Crews discovered a van that had come to rest on its side following a collision with a lorry. “Ambulance staff treated him for back pain and shoulder pain before transporting him to Heartlands Hospital. “The driver of the lorry, a man, was uninjured in the incident. Monday 4th April 2016 – 12.40pm – Jamie Arrowsmith. A woman has died following a collision between a car and a lorry this morning. West Midlands Ambulance Service was called to the A50 near to Blythe Bridge in Stoke-on-Trent, shortly after 9am and sent an ambulance, a paramedic area support officer and a BASICS doctor to the scene. A West Midlands Ambulance Service spokesman said: “Crews arrived to find a car that had collided with a lorry. “The car passenger, a woman, had suffered serious injuries in the collision. “Unfortunately it quickly became apparent that nothing could be done to save her and she was confirmed dead at the scene. Saturday 2nd April 2016 – 8.30pm – Claire Brown. 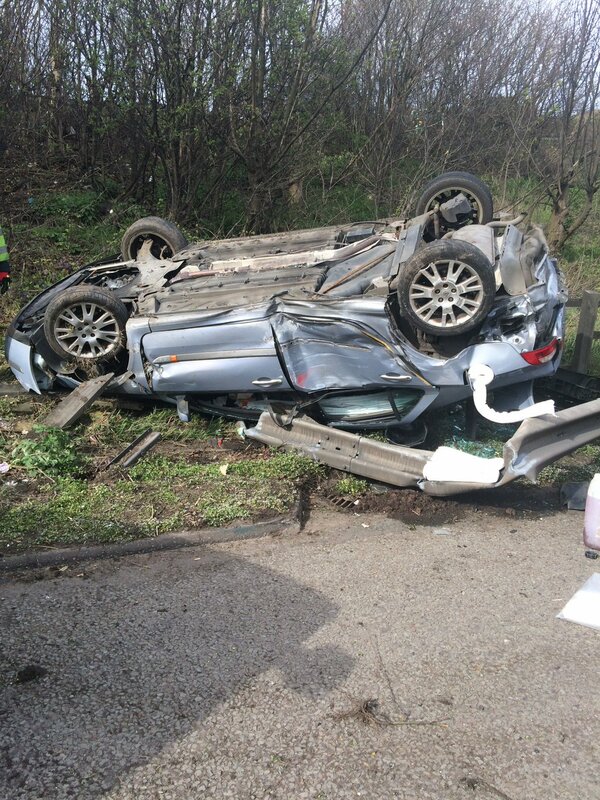 A woman who had been involved in a two vehicle collision was trapped in the wreckage for an hour whilst emergency services worked to cut her free. West Midlands Ambulance Service was called to the B5069 Gobowen Road, Oswestry just before 5.00pm (Saturday). An ambulance, a paramedic area support officer and the Midlands Air Ambulance with and MERIT trauma doctor on board attended the scene. A West Midlands Ambulance Service spokeswoman said: “The two car collision had left one woman, in her 50s, trapped by her legs in the car. The fire service worked to cut her out of the car whilst ambulance staff administered pain relief and fluids as she had sustained pain to her chest and abdomen. “After an hour, the woman was freed from the wreckage and ambulance staff immobilised her with a neck collar and spinal board. She was then taken by air ambulance to Royal Stoke University Hospital for specialist trauma care. Friday 1st April 2016 – 6.10pm – Claire Brown. Two elderly women and a man have been injured following a two car RTC on the old A5 Road near Norton in Shropshire this afternoon. An ambulance came across the collision at 3.45pm at the junction of the B4394 and B43801. Two further ambulances, a paramedic area support officer and the Midlands Air Ambulance from Cosford with a MERIT trauma doctor on board attended the scene. A West Midlands Ambulance Service spokeswoman said: “The two cars had been involved in a serious collision and one passenger from one of the cars was trapped. “The passenger, an elderly woman, sustained chest and pelvic injuries in the collision and ambulance staff worked with the fire service to extricate her from the wreckage. She was given pain relief and immobilised before being airlifted to Royal Stoke University Hospital. “The driver, an elderly man, was assessed but escaped injury and didn’t require hospital treatment. Friday 1st April 2016 – 7.05am – Claire Brown. An elderly man ended his bicycle ride last night in the back of an air ambulance after a collision with a car in Malvern. West Midlands Ambulance Service was called to the junction of Sherrards Green Road and Pickersleigh Road in Great Malvern just before 5.30pm (Thursday). An ambulance, a responder paramedic, a paramedic area support officer, a BASICS doctor and the Midlands Air Ambulance from Strensham attended. A West Midlands Ambulance Service spokeswoman said: “The elderly man had been riding his push bike when he was in collision with a car. When ambulance staff arrived they were told by passers-by he had suffered no loss of consciousness.